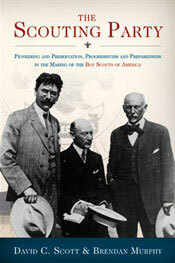 Set in the Progressive Era so dominated by President Theodore Roosevelt, The Scouting Party tells the story of the strong-minded and at times conflicting individuals – including Roosevelt – who shaped the Boy Scouts of America as it was founded a century ago in 1910 and took shape within a few years. The Scouting Party examines in particular the role of British-Canadian naturalist Ernest Thompson Seton, whose trailblazing Woodcraft Indians strongly influenced the British founder of Scouting, General Robert Baden-Powell. Seton became the intellectual mainspring of the Boy Scouts of America in its formative years. But BSA organizers preferred Baden-Powell’s more conventional model to Seton’s vision of a youth movement based on the culture and values of the American Indian. Seton, well known to Americans for his best-selling book, Wild Animals I Have Known, and his vivid lectures on wildlife, found himself increasingly at odds with BSA management between 1910 and 1915 over issues of organizational philosophy. He also clashed frequently with Daniel C. Beard, an illustrator for Mark Twain and founder of the Sons of Daniel Boone, a rival to Seton’s Indians, over precedence in the field. Seton and Beard both wrangled with BSA Executive Secretary James E. West, who arbitrated their frequent wrangles while keeping BSA solvent as the organization rapidly expanded. The exuberant personality of U.S. senior statesman Theodore Roosevelt looms large throughout The Scouting Party as an influential early patron – and at times critic – of BSA as it embraced pacifism in the initial years of the First World War. Upon U.S. entry into the conflict in 1917, however, BSA threw itself behind the war effort, in the process becoming a quintessential American institution. In relating the personal interactions that shaped BSA in its early years, The Scouting Party also provokes reflection on the path American Scouting might have taken if it had embraced Seton’s notions of harmony with nature as an important factor in the development of human potential.